What would happen if we started asking better questions? Questions that left room for messy. Questions that didn’t wrap everything up into a black and white bow at the end of class. Questions that left room for wonder & curiosity & what if. Questions that dealt with real life. 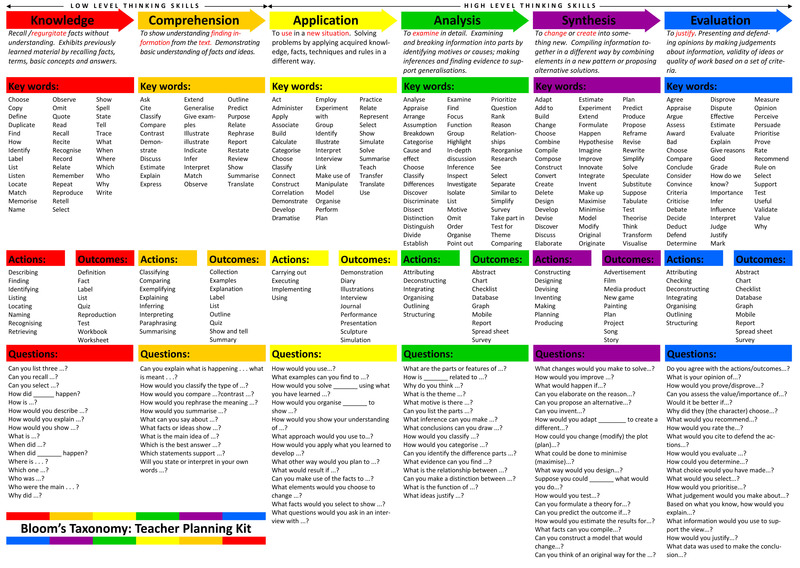 Our Educator friends are very familiar with Bloom’s Taxonomy, and it is a great resource we need to be using regularly when we are writing or tweaking curriculum or lesson planning. Better questions often appear in curriculum for preteens, but we need better questions for children of all ages. Children are capable of wrestling with challenging questions, even in preschool. Start at the bottom of the pyramid with “remember.” This section of thinking is basic recall & concepts. Think who, what, when, and where. It doesn’t take very much brain power to answer these questions. These are basic fact regurgitation type questions. As your questions move up the pyramid students must begin to use more & more higher-order thinking or critical thinking skills. Questions become tools for teaching, not just testing. “…students tend to read and think based on the kinds of questions they anticipate receiving from the teacher. If students are constantly bombarded with questions that require only low levels of intellectual involvement (or no involvement whatsoever), they will tend to think accordingly. Conversely, students who are given questions based on higher levels of thinking will tend to think more creatively and divergently.” (source) When we ask higher-order thinking questions we are creating safe environments for children to wrestle with God, scripture, and faith. Wrestling with these big, deep questions often builds faith. It’s why Jewish Rabbis frequently answer questions with questions. Jesus was asked 183 questions in the Bible. He only answered 3. We shouldn’t always have an easy answer ready when there isn’t always an easy answer. Before I completely lose you, I promise I’m not a cold-hearted, calloused cynic who wants kids to realize how hard & ugly the world is before they grow up. I am not advocating for sharing TMI with our sweet innocent babies. I am advocating for creating environments where we can ask hard questions and be comfortable with not always having an answer. Or maybe sometimes not sharing the answer with children even when we do have one. Can we get comfortable with saying, “I don’t know”? What if we take after our Jewish brothers & sisters and don’t put a period after “I don’t know”? What if we said let’s try to figure that out together? Or “What do you think about that?” and not correct them if their answer is obviously a little (or way) off base? We can trust God to work out a child’s slightly incorrect theology over time. After all, I know God has done exactly that in my life and continues to open my eyes every day. Higher-order questioning is scary. It’s scary because you don’t know what is going to come out of that child’s mouth. It’s scary because it can derail the entire course of your perfectly planned & timed lesson. It’s scary because sometimes all you get in response is blank stares. And it’s scary because sometimes God does crazy powerful things with one open-ended, challenging question and what ensues can only be explained through the work & power of the Holy Spirit. It takes the average learner 8 seconds to formulate an answer to a higher-level question. That may not sound like very long but it feels like an eternity when you’re the teacher and you’re met with blank stares in response to a question. Try counting in your head next time that happens. Get comfortable in the silence. Allow students the space to think critically. Don’t always call on the first person who raises their hand to answer. Waiting patiently allows other students time to think. Set aside some time to take a good long look at the questions you ask during your lesson. Are they mostly “Remember” questions? If so, spend some prep time writing better questions. This chart is extremely helpful when formulating better questions.